To describe the origin of the vessels supplying the anterior sub-axial cervical vertebrae (C3–C7) to further understand their potential influence on anterior bone loss after anterior cervical spinal surgery. Cadaveric dissection was performed on ten adult human necks after latex perfusion of their subclavian, common carotid and vertebral arteries. The nutrient vessels of the sub-axial cervical spine were identified and traced to their origin. The course and distribution of these vessels and their nutrient foraminae are described. In all cases the anterior nutrient vessels were derived from the thyro-cervical trunk with branches that passed over the longus coli muscles forming a leash of vessels in the pre-vertebral fascia which subsequently extended in a frond-like pattern to pass onto the anterior aspect of vertebrae. The more cranial the cervical level the fewer the number of nutrient vessels and foraminae. The distribution of the foraminae on the anterior vertebral body followed the oblique supero-medial course of the nutrient vessels. Nutrient vessels perforate the cervical vertebrae on their anterior surface. These are derived from a leash of vessels that lie within the pre-vertebral fascia overlying the longus coli muscles. The origin of these vessels is the ascending cervical artery with a variable contribution from the transverse cervical artery. We would like to acknowledge the body donors and their relatives, Christine Hammer for her photographic input, and Christoph-Ekkehard Heyde and Glynny Kieser for their editorial input into this study. LD: Cadaveric dissection, data extraction and analysis, manuscript writeup. HV: Cadaveric dissection, data extraction and analysis, manuscript writeup. 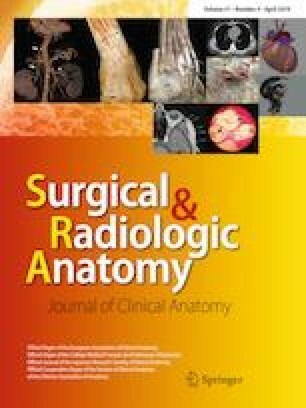 SL: Cadaveric acquisition, dissection, data extraction and analysis, manuscript writeup. NH: Study conception, cadaveric acquisition, dissection, data extraction and analysis, statistical analysis, manuscript writeup. OG: Data analysis, interpretation and manuscript writeup and review. LB: Data analysis, interpretation and manuscript writeup and review. IO: Data analysis, interpretation and manuscript writeup and review. VP: Data analysis, interpretation and manuscript writeup and review. JMV: Data analysis, interpretation and manuscript writeup and review. DCK: Study conception, cadaveric acquisition, dissection, data extraction and analysis, statistical analysis, interpretation, manuscript writeup. None declared related to this study.